in 2015, arki_lab in collaboration with TERROIR ApS and Deane Simpson, and by the Danish Ministry of Immigration, Integration and Housing was assigned to conduct a research project focusing on intergenerational integration in urban and suburban areas. Here you can download a short guide about designing intergenerationl cities, which is based on arki_lab’s findings during the course of the research project. Today Western societies in particular-and the rest of the world generally- is divided by age. From our birth to our death, society keeps us well within spaces occupied by peers to the degree that other age groups seem alien and unapproachable. This divide, though it is often relatively invisible and seemingly natural, guides our everyday actions more than we know. 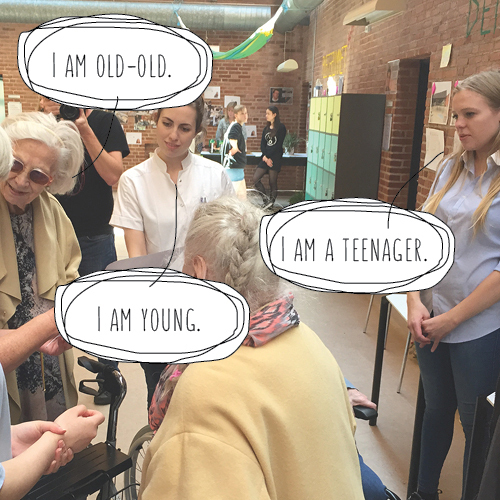 As an urban design office, we see firsthand the degree to which our cities are divided into age-specific areas, we hear the difficulties that people of different ages have in interacting with each other and we feel the widespread consequences to the bone. To our greatest relief, we have experienced that urban design can help address these problems specifically. We therefore have an ongoing interest in the dynamics of age and how it shapes our society. During the last 2 years we had the opportunity to investigate this interest further. A notable demographic change marked by the increase of ageing population has urged the Danish Government to allocate financial and human resources to tackle the issue. Consequently, in 2015, arki_lab in collaboration with TERROIR ApS and Deane Simpson, and by the Danish Ministry of Immigration, Integration and Housing was assigned to conduct a research project focusing on intergenerational integration in urban and suburban areas. Community cohesion in urban and residential areas was the main task of the overall project, with a special emphasis on integration of elderly citizen groups. Moreover, the concept of shared living communities, which accommodate all generations, was the architectural focus point. The final report is roughly 150 pages, where we have given theoretical examples on how age can be understood and how age segregation permeates society in an institutional, spatial, and cultural sense. We have investigated three cases in Denmark and have provided concrete empirical examples of how age segregation issues can be dealt with from our everyday practice as an urban design office. We find age integration a very important issue that needs our immediate attention. Therefore, we’d like to share our main findings during the course of the project about integration and citizen participation with everyone who works with cities or is interested in how cities work. Below you can find our short guid to “How to Design Intergenerational Urban Spaces” which is based on the report we have conducted for the ministry. If you are intersted to read the complete report, send us an email and we’ll provide you with a copy. It is available in both Danish and English. It is our hope that this could be a departure point for discussing age integration in our cities and how we can foster it in the future by Designing Cities WITH People.